The effects of pecan nut (Carya illinoinensis) and roselle flower (Hibiscus sabdariffa) as antioxidant and antimicrobial agents on shelf life extension of sardines (Sardina pilchardus) were evaluated over a period of 5 days at 7 ± 1 °C. Treatments consisted of the addition of 5% and 10% w/w pecan nut, 5% w/w roselle flower and a combination of 5% of each. Physicochemical (lipid oxidation, fatty acids, hexanal and biogenic amines), sensory and microbiological characteristics of fish samples were periodically analyzed. All treatments effectively improved physicochemical quality parameters, with 10% w/w pecan nut having the highest effectiveness. The presence of roselle flower reduced microbial growth. Our findings suggest that addition of a natural preservative combining pecan nut and roselle flower may extend the shelf life of fresh sardines during chilled storage while maintaining quality indexes. Villasante, J. [et al.]. 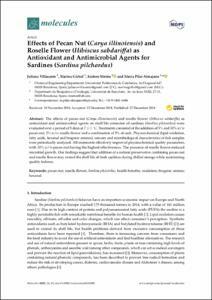 Effects of Pecan Nut (Carya illinoiensis) and Roselle Flower (Hibiscus sabdariffa) as Antioxidant and Antimicrobial Agents for Sardines (Sardina pilchardus). "Molecules", 27 Desembre 2018, vol. 24, núm. 1, p. 85-1-85-13.